Oh, please. We are still coping with the view of Atlas taking a leisurely run through the neighborhood like a boss planner out for his cardio workout before taking off for his first meeting. What could possibly be next? 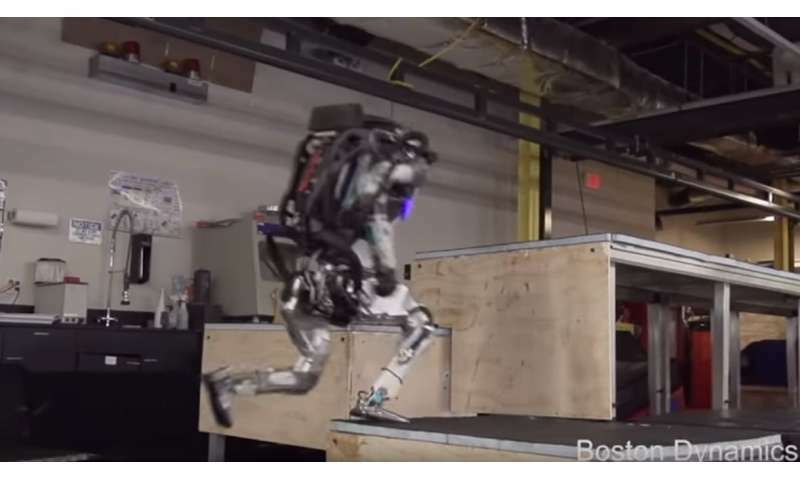 Next: Boston Dynamics has updated the world on Atlas in a video posted October 11. Short and sweet: Atlas does parkour. Back-pedal for a moment, though, and consider the hoops Atlas the robot has successfully gone through to be where it is today. Engineering to do parkour-style stunts was preceded by evolutionary steps. First, said New Atlas, Atlas mastered balancing, and before you could say Friday the Thirteenth, there was footage of the robot learning how to do a backflip. What is parkour? It has its roots in military obstacle course training, No assistive equipment. Plenty of reasons to fall over and give up. This is a training discipline that sets a complex environment where requirements include such movements as running, climbing, vaulting, jumping and crawling. They used a step height of 40 cm (1.3 ft) and the highlight of the viewing experience is seeing how the robot is superior in its leaping up the 40-cm steps. Boston Dynamics said the robot’s hardware takes advantage of 3D printing, to save weight and space. The team boasts of the high strength-to-weight ratio. Brandon Hill in HotHardware points to what is different about the “now” Atlas from the Atlas of older views. Mainly, Hill wrote that we saw Atlas previously having to stop, to gather its “thoughts”, and then use propulsion from both feet. One tries not to join the bandwagon of observers that associate Boston Dynamics’ advanced robots with words like “nightmare” and “creepy” and “Armageddon” but, inevitably, whether predicting doom or not, there are attempts to figure out where the Atlas evolution will one day lead. One can imagine but not be certain. “The company has suggested Atlas may one day be used in search and rescue operations,” said the BBC. “While this is just one demo showcase, the technology exhibited here could also be enormously useful in the real world, where the ability to see environments in terms of how they can help with locomotion (for instance, a wall that could also be a platform) would make robots such as this useful in a range of scenarios,” said Luke Dormehl in Digital Trends.